On the Sunday of our 2014 exhibition we had a visit from BBC Radio Norfolk’s Treasure Quest team as we were the holders of one of their clues for that weeks quiz. 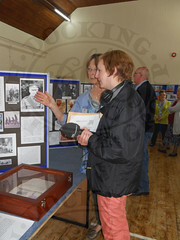 Later in the afternoon our secretary Helena Aldis did a short telephone interview on the following programme Treasure Quest Extra Time, where she was asked about the exhibition, the heritage group and its activities. Click on the play button below to listen to her interview.